What's in a Name challenge category: The letter X in the title. 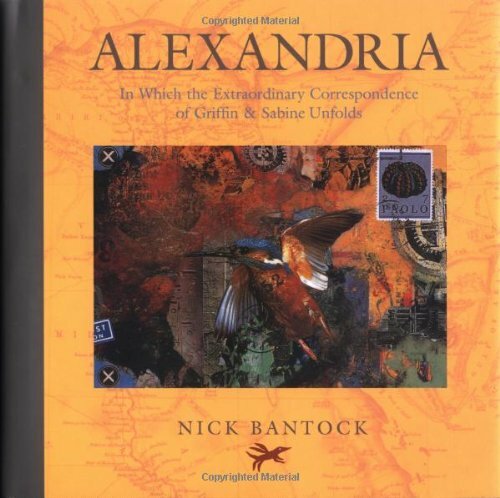 Full title: Alexandria: In Which the Extraordinary Correspondence of Griffin & Sabine Unfolds. Have you read this book? Why not leave a comment to tell me your thoughts about it? This is going to be somewhat of an unusual review, as the book is the middle volume of a trilogy that tells a single story (and links to another trilogy), and I have not read the previous book. However, I enjoyed it anyway and it fits into the What's in a Name challenge category of a book with the letter X in the title. The Griffin and Sabine trilogy garnered critical acclaim and praise for originality of presentation, as well as bestseller status when it first came out, and the author went on to write The Morning Star trilogy, which continued the story with new protagonists, followed by a final, 7th book that was published last year. I got my hands on the first trilogy and this book at a charity bookshop several years ago and while I enjoyed the Griffin and Sabine books for the artistic aspect, I found the story they told to be paper-thin and not very original. I decided to put this one aside for a while in the hope that I could get my hands on the first and third books in the trilogy, but I haven't come across them yet at a price I'm willing to pay for them, so I finally gave up and decided to read it. It is just as colourful and beautiful to look at as the previous books, with illustrated postcards and letters you must pull out of envelopes and unfold in order to read, and like Griffin and Sabine, it tells a mystical story of lovers who correspond with each other. It also contains letters and postcards from Griffin and Sabine to Matthew and Isabella, the trilogy's protagonists, that guide and advice them what to do. I will pass no judgement on the story itself, as I came into the middle of it, but is appears to be a continuation of the mystical events of the Griffin and Sabine trilogy, overlaid with another love story. The artwork is delightful to look at and I will enjoy going over it a second time to unravel the symbolism in the images. Also, I think I will make an effort to acquire the remaining three books of the series, because I want to keep them, if only for the art. And who knows: I might even reconsider my opinion of the storytelling once I have all the books and can read them as one story. Nick Bantock on the end of Griffin and Sabine's epiccorrespondence. Griffin and Sabine by Nick Bantock: An Extraordinary TaleAbout Art, Beauty, Madness, and Kindred Spirits.